The Karen I. Fryberg Health Clinic recently completed renovations that saw several improvements to the building including new patient rooms, additional dental chairs as well as new check-in stations. The clinic’s reason for the remodel was not only for modernization, but primarily to create a better overall experience for the patients, factoring in community feedback when designing the new floor plan. Prior to the renovation, one of the biggest issues many patients encountered was sitting in the waiting room for a long period of time before being seen by a doctor. Through the remodel, the clinic addressed this issue by incorporating more acute care patient rooms. By adding more rooms, the clinic is able bring more patients back at a time to get their vitals checked by a medical assistant before they’re seen by a doctor. The clinic has also recently implemented the Versus Technology system to help create a more efficient visit for their patients. Versus Technology is an inferred/radio frequency locating system. The system has been utilized in many clinics and hospitals across the nation for a number of years to help optimize patient flow. Often times, patients have to visit many areas of the clinic during the same trip including the x-ray rooms and labs as well as dental and optometry. The Versus system ensures that patients don’t get lost along the corridors, aren’t left unattended for too long and most importantly, are safe while receiving care at the health clinic. 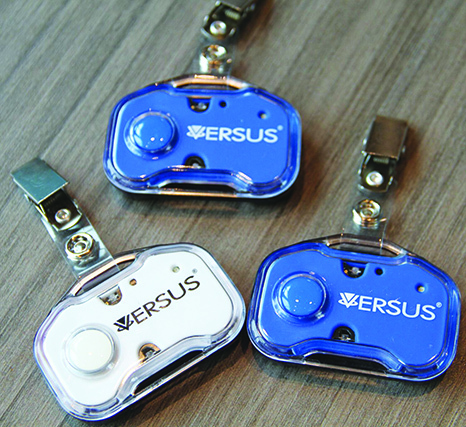 Upon checking-in, patients are given a Versus badge attached to a small clipboard, which is carried by the patient during their entire visit. This allows health clinic staff to see on their computer screens where the patient is at in the building and how far along they are in their appointment. If a patient is waiting in one area for more than fifteen minutes, staff is alerted via a screen pop-up. The staff then checks on the patient and gives them an update as well as an expected wait time, letting the patient know they haven’t been forgotten. The badges also help employees locate one another for assistance during the busy hours of the day. All staff members at the clinic have a badge that is worn at all times while working. The staff badges have a button for emergency situations, and when pressed all employees are notified and can rush to that location to help. Versus Technology also helps practitioners by allowing them to review the amount of time spent with their patients, which helps with scheduling. For instance, if a doctor schedules his appointments in thirty-minute increments but often spends an extra five minutes with each patient, that increases the wait time for each of his following patients. The new system allows that doctor to recognize that he needs to schedule all of his appointments for five additional minutes and eliminate patient wait time. The health clinic decided to use Versus after visiting the Monroe Providence Clinic and seeing the system in action as well as conducting a survey from their patients. “We talked to patients who were utilizing Versus and asked them how they liked it and most of them loved it,” explains Dr. Rhonda Nelson, Tulalip Health Clinic’s Health Informatics Manager. “I don’t think there was a single negative piece of feedback because they really felt it helped the flow of their visit, making sure they were getting where they needed to go and when they needed to get there. The clinic officially began using Versus on April 17, which has been met with a mix of extremely positive reviews as well as heavy concern from the elders of the community. “Many elders expressed concern with me, one of them was privacy,” says Dr. Nelson. “They were wondering if we were going to monitor how much time they spent in the bathroom. We’re looking at this as more of an overall thing, like the amount of time they spend alone and are waiting. Their other concern was, are you going to shorten my visit to make your staff look good, are you under the gun to get me out of the room? That had been voiced by some of the elders, asking if we’re going to rush them. And the answer is no, that’s not our goal. Our goal is to see how long you are waiting, if you’re getting seen in a timely manner and if we’re communicating with you about what’s happening. This entry was posted in Health, News, Tulalip News and tagged Karen I. Fryberg Health Clinic, Tulalip, Versus Technology by Kim Kalliber. Bookmark the permalink.